Frustrating.. Should have been on the bigger board and maybe the 7.5m. Felt like I spent all my time trying to keep upwind. I wanted to get higher where there was more wind and less bergs.. I was planning on trying for an hour ..but you need wind for that..
On & Off the plane. Very patchy in the flats.Only one bearaway. I enjoyed practising gybes and even though the gusts weren't long enough to get a planing exit I learnt a bit. The 21cm was ok if you avoided the obvious weedbergs. I wasn't paying attention and hit a thick patch with the 24cm and had a slow catapult. Luckily I was only doing about 5kts and ended up still hooked in but standing near the sail..
My arm is still dodgy so it was also a good session to practise relying on the harness in all conditions. Figured it wasn't much fun so I came in and got the bigger board. Should have put the 7.5m on but the 7 was ok in the occasional gust. Headed into the chop for some fun. On & off the plane again and the wind must have been veering as I felt like I was constantly working to stay where I was. Cold in the am 14 degrees so winter wettie. All by myself . the afternoon crew of Milsy , Norm and Pete went out as I left. It had turned more S and they looked like they got a few gusts. Tried the Garmin Alpha Data Field today. Foiling wasn't really ideal as I didn't do many traditional gybes. But the watch did appear to be displaying reasonable numbers. I thought I saw a 13.5 but the GT31 in KA72 often comes up with slightly different alphas anyway. Up and down still happy when in a gust. 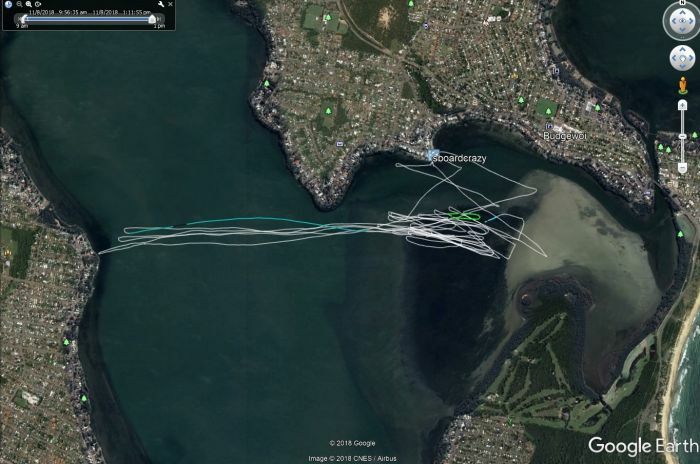 Ended up geting on foil and sailing down to wangi and back after meeting with Walshy and Brent I didnt crash once today and was very happy with foiling. love the slingshot fast and stable best I have tried so far by a mile.Still only managed 23 on foil today but that was still very comfy doing it. I even did a full planning gybe above water.